Chalkhills: Reviews: XTC: "Black Sea"
Although they have produced cleverer, more textured and complete-sounding albums, this one record is a perfect snapshot of the throbbing, muscular machine that was Swindon's finest at their peak as a live band. They took the anger of punk, the angles of New Wave and the groove of Ska and wrapped it up with inch perfect performances to produce an album that still sounds fresh today. It's amazing how every bass line on this album is both unique and unexpected. The next time you feel like you're in a rut, check out some of these grooves. © 2001 United Entertainment Media Inc. All rights reserved. "Black Sea" läutete die Periode ein, in der XTC gern mit den Kinks verglichen wurden und ihre Verknüpfung von Melodien im schmissigen Proletariat-Chic mit ironisch-intelligenten Versen englischen Pop auf den Punkt brachte. XTC, Black Sea. Virgin Records, 1980. Virgin recently remastered all of the XTC records from 1977-92 and they all come in those cool LP-style sleeves, so go out and get 'em! Black Sea is definitely one of the best of the bunch, featuring some of their most well-crafted songs performed in a more hard-hitting approach than any of their previous efforts. The record gets started on the right foot with "Respectable Street," a Kinks-style number about life in the English suburbs. They also find time to rip American politics in the awesome ska tune "Living Through Another Cuba" and sing of the drawbacks of the spoken word in "No Language In Our Lungs." The record showcases some of their best singles in "Generals And Majors," "Love At First Sight" and "Towers Of London." Another single, "Sgt. Rock (Is Going To Help Me)" drew XTC a lot of bad press from feminists who hated the song's misogynistic overtones. Andy Partridge called the track "the least favorite of all my songs. It was written as a joke about a little weed who looked up to Sgt. Rock. It was a nerd's sad fantasy." Black Sea is one of XTC's best records and definitely their most rocking. How underrated are XTC? They were Blur before Blur were Blur! 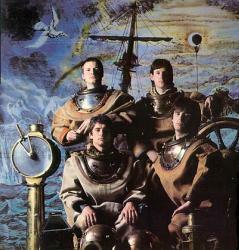 Britain's XTC was one of the first bands to ride the "New Wave" that followed the tsunami of punk rock in the late 1970s. This album, released as an LP in 1980, builds on the success of "Drums and Wires" with bouncy, angular pop tunes with a social ("Respectable Street") and political ("Living Through Another Cuba," "Generals And Majors") bent. XTC's lyrics are clever, funny, and intelligent, and their music is full of rewarding hooks and twists. The band's puckishness was reflected in the original LP's packaging -- it came in a plain green paper wrapper bearing only the band's name and the album title. You had to buy it to see the cover photo (nothing shocking, though -- just the lads in diving suits). This is fun and intelligent New Wave pop-rock -- glad it's back! Copyright 2001. All Rights Reserved. Released in 1980, Black Sea stands as not only one of XTC's best records, but as the album in which the group merged the Beef-heart-esque guitar arrangements from their previous record, Drums and Wires, with their growing fondness for Beatles-inspired pop. With seminal '80s production vets Steve Lillywhite and Hugh Padgham (U2 and the Police, respectively) at the controls, Black Sea manages to sound like a record from 1980 without sounding dated. The album's tones, for the most part, are brash and clean, with touches of crunch. These sounds bring out the guitars' often angular harmonies. Guitarists Andy Partridge and the since-departed Dave Gregory never waste a single note or rhythmic stab. Gregory's solos on "Rocket from a Bottle" and "Generals and Majors" are absolutely perfect. However, the tune that really highlights the guitar's role on the album is "No Language in Our Lungs." "The guitars have a great collision effect that reminds me of certain moments from the Beatles Revolver," says Andy Partridge, "particulary tunes like 'Doctor Robert' or And Your Bird Can Sing.' And 'No Language in Our Lungs' has something we felt Free always had--a very stately tempo--a slow, slightly funereal funk." Any two-guitar band looking to add some spice to their arrangements can't go wrong by studying Black Sea. Virgin. Everyone loves nostalgia, especially in music. Witness the revival in 'all things old' started by those jeans ads in the eighties and while people are willing to acknowledge the importance and influence of the giants of the past; the Zeppelins, Kinks and Beatles of this world, there are countless others who have fallen by the wayside. To the youth of today their names are associated with tired, old 'has-beens' or, worse still, not recognised at all! All right, I realise that this is a bit of a cheat but I thought I'd break you in gently. Now I know there's hardly anyone who's not heard of XTC, especially the readers of this fine journal, but, then again, how well do you casual observers really know them? XTC were never as popular as you may think. Did you know that for instance, of over twenty-seven singles, only three entered the top twenty, most single releases only reaching the mid fifties and, of those three, only 'Senses Working Overtime' managed to scrape into the top ten. XTC, of course, are of particular interest to us because of their local link. All hailing from Swindon; Andy Partridge (vocals, guitar), Colin Moulding (vocals, bass) and Terry Chambers (drums) hooked up with Barry Andrew (ex-King Crimson) on keyboards in 1976. The band's first two albums, 'White Music' and 'Go 2' were upbeat organ-driven new wave affairs while their third, 'Drums And Wires' gave fans the first indication of a new direction and greater potential. By the time of their fourth LP, Andrews had left to be replaced by Dave Gregory (believed to have originated from Calne) on guitar and the revised XTC were to unveil their new sound in all its glory. From one single straight into another with the Colin Moulding penned 'Generals And Majors'. Wow two classic pop singles in a row! From there we move to the mock reggae of 'Living Through Another Cuba' whilst elsewhere there's the laid back 'No Language In Our Lungs' and the almost African sounding 'Travels In Nihilon', something which would lead to greater experimentation on their next LP, the double set, 'English Settlement'. But it's 'gritty pop' which seem to be the keywords throughout this album. From 'Love At First Sight' to 'Towers Of London'; from 'Paper And Iron' to 'Sgt. Rock' this is classic quintessential English pop with only the aforementioned 'Travels In Nihilon' making any attempt to break the 5 minute barrier. So, if you're looking for some classic Brit-pop sounds but are bored with the so-called new faces, you could do far worse than dip into XTC's back catalogue, this platter in particular, and hear how it should be done!